Now that were in the midst of the showing the first batch of science grade data from the K2 mission, I thought I’d give some more details about the K2 light curves and how K2 mission works. Planet transits are small changes in the star’s light, a Jupiter-sized object produces only a 1% drop in the brightness of a Sun-like star and Earth-sized planets generate even smaller dips at the 0.01 % level. Kepler needs the stars to be precisely positioned on its imaging plane in order to achieve the photometric accuracy required to detect these drops in light. To do this the stars have been positioned and kept at the same location with millipixel precision. Kepler was able to achieve this during it’s primary mission and the first half of its extended mission To do this Kepler used three reaction wheels (one for x, y, and z directions) with one backup spare to finely nudge the spacecraft to keep the target stars positioned during a Quarter. Kepler suffered two reaction wheel failures and can no longer operate in this mode. This effectively ended the monitoring of the Kepler field, that Kepler was staring at for 4 years. The drift of the spacecraft was too large that the photometric precision was sufficient enough for a transiting planet search. This is where K2 comes in. 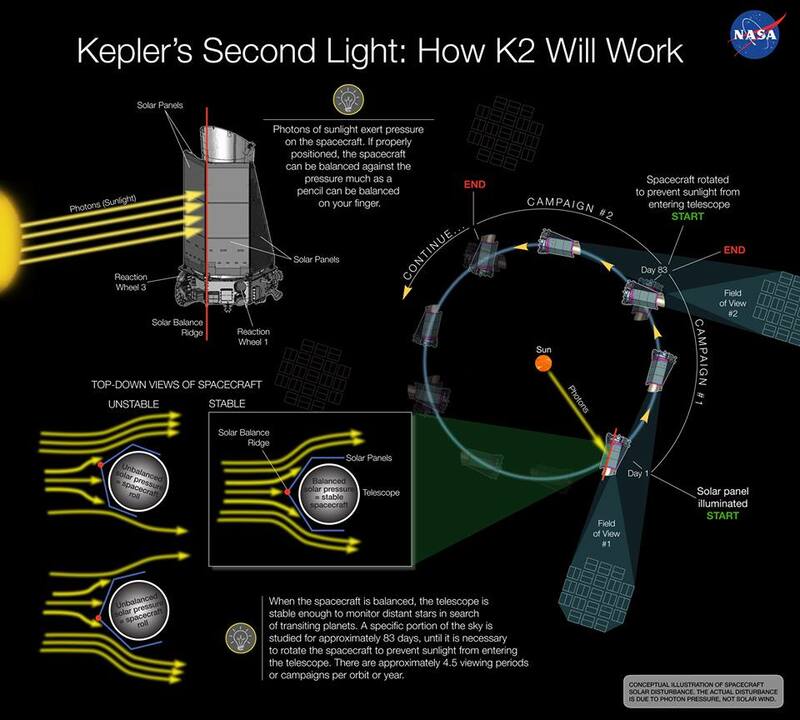 The K2 mission repurposes the Kepler spacecraft. Kepler has thrusters but they are used for coarser pointing corrections, they can’t be used to be the fine adjustments that used to be achieved with the third reaction wheel, but you can use the Sun in a way to be that reaction wheel. This is how K2 works. If Kepler is pointed observing fields that are along the plane of the Solar System, than the two working reaction wheels are used to maintain the x-y locations of the stars on the focal plane with the Sun and thrusters taking care of the rest. Kepler is positioned such that the irradiation of the Sun is balanced which basically keeps the spacecraft from rotating. This is a quasi-stable and every 6 hours or so the spacecraft will start to roll. The thrusters can then be used to roll the spacecraft back to it’s original orientation. (You can see this in the raw light curves just plotted. You can see a Nike check-like feature that dips slowly and rapidly goes up.The light curve processing Andrew does tries to remove as many of those artifacts and others as possible. It does a pretty good job, though occasionally there may be an artifact that remains. ) This scheme works pretty well at keeping the stars on Kepler’s focal view located on the same pixels and achieves photometric precision about 3x time worse than what the original Kepler mission was achieving. With this, we can still find planets around other stars, especially smaller cooler stars. The K2 light curves we’re currently showing on Planet Hunters come from Campaign 0. Campaign 0 is the first full science grade test field data for the K2 mission. 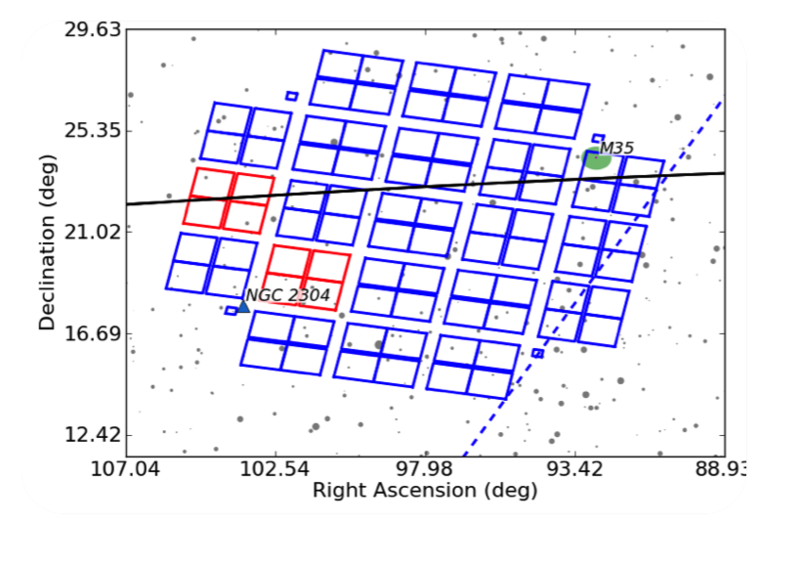 Kepler was staring at a field centered around see a region of the sky plotted in the star chart below. The observations commenced on March 12 and the campaign was completed on March 27th of this year. Campaign 0 serves as a full shake down of the performance of the spacecraft in this new mode of operating. The specific targets Kepler monitored in the Campaign 0 were community driven with astronomer putting proposals for what they wanted to be observed, and were decided by a Time Allocation Committee (TAC) organized by the Kepler team. You can learn more about the observing proposals and selected targets for Campaign 0 here. On the site we’re only showing roughly 30 days worth of data, that’s because the light curves derived from the second half of Campaign 0 are more indicative of what the rest of the K2 mission will be like, so we’re only looking at that data. The observations at the start of the Campaign 0 were taken with Kepler not in fine pointing mode with a guide star and thus the positional consistency of the target stars over time on the imager is lower, causing a decrease in the photometric accuracy. Therefore we’re focusing on the better quality second half data. Future K2 Campaigns will have the full ~75 days worth of data in fine point mode, and we plan on showing all of the observations on the Planet Hunters website in the future. So were the accuracy of the data from the first half of Campaign 0 too low to even detect Jupiter- and Neptune-sized planets?